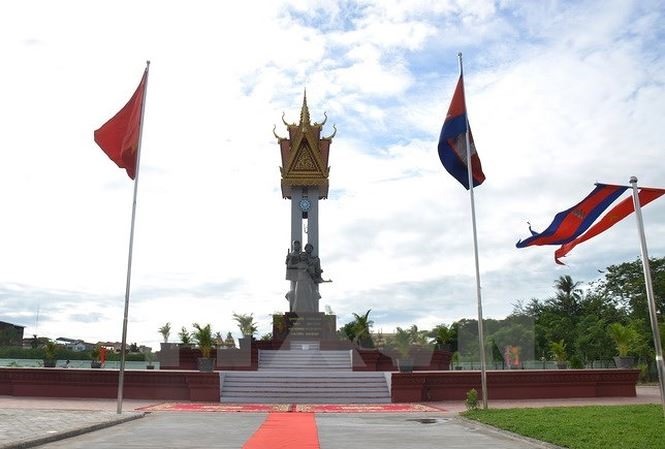 Celebrations for the 65th anniversary of the Kingdom of Cambodia’s Independence Day on November 9 were successfully organised by the Royal Embassy of Cambodia to Việt Nam and the Việt Nam-Cambodia Friendship Association. It was attended by members of ASEAN diplomatic missions to Việt Nam and Cambodian students. November 9, 1953 is a milestone in the past 65 years in the royal mission for the homeland and the Cambodian people. The Father of Independence, Preah Norodom Sihanouk Preah Borom Ratanak Kort, devoted his strength and spirit to the struggle to claim Cambodian independence from French colonialism. It is thanks to this that Cambodian is enjoying the dividends of peace, stability and rapid development. Cambodia is a successful example of a war-torn country which has succeeded in making a complete and proud transformation. This is thanks to dramatic changes in Cambodia’s history over the past four decades that have come from the outstanding leadership of Samdech Akka Moha Sena Padei Techo Hun Sen, Prime Minister of the Kingdom of Cambodia. Cambodia now enjoys peace and has become a popular tourist destination in Southeast Asia; a food exporter; an outstanding performer in poverty reduction and improvements in social indicators have been made. Cambodia is recognised as one of the world’s fastest-growing economies, which recently has successfully graduated from its status as a low-income country to a lower-middle income country, owing to its high economic growth of around 7 per cent per annum over the past two decades. Cambodia looks forward to becoming an upper middle income country in 2030. Cambodia is now governed by the rule of law and firmly respects multi-party liberal democracy, with regular, free and fair elections, held to enable its people to choose the country’s leadership. In the general election of Cambodia’s sixth legislature of the National Assembly in July, nearly seven million Cambodians cast their votes and decided on their political choices freely and without any coercion, threat or violence. By their votes, Cambodians reaffirmed their desire for peace, stability and long-lasting sustainable development. On Cambodia-Việt Nam relations, from the beginning of the struggle against the French colonialism, Cambodia and Việt Nam have always supported each other on the basis of a summit between the leaders of three Indo-China countries until the establishment of diplomatic relations between Cambodia and Việt Nam on June 24, 1967 by our King Norodom Sihanouk and President Hồ Chí Minh. Their achievements are deeply and forever rooted in the hearts of the two peoples. Cambodia and Việt Nam enjoy a close relationship as a solid foundation for strengthening our existing bilateral co-operation, which has no doubt shaped our future comprehensive relations under the mantra of “good neighbourliness, traditional friendship, comprehensive and lasting co-operation”. The close relation has contributed to great achievements of both sides. In terms of trade and investment flows, both countries aim to reach the US$5 billion target set for 2020. Beyond bilateral relations, the two countries have enjoyed solid co-operation in various regional forums including ASEAN, Mekong sub-regional frameworks and other multilateral co-operation mechanisms.